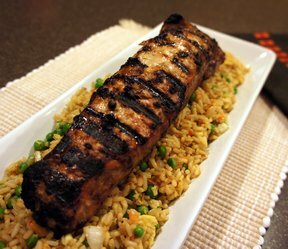 This combination of sweet and smoky flavor on pork tenderloin will appeal to everyone at the dinner table. 1. Preheat oven to 400°F. Place pork tenderloins in foil-lined baking pan. Rub pork with oil. Mix 1 teaspoon each of the paprika and seasoned salt and 1/2 teaspoon of the Smokehouse Pepper in small bowl. Sprinkle seasoning mixture all over pork. Cover with foil. 2. Roast 20 minutes. Meanwhile, mix honey, vinegar, remaining 1 teaspoon paprika, and remaining 1/2 teaspoon each seasoned salt and Smokehouse Pepper in small bowl. Set aside. 3. Remove foil from pork. Brush pork with honey mixture. Roast 10 minutes longer or until pork is desired doneness.